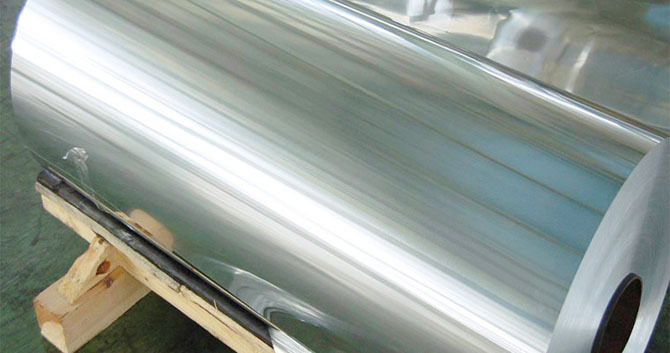 The production of aluminum foil plate usually starts out the same way as plate but the slab is further rolled through a continuous mill to reduce thickness and wound into a coil at the end of the line. These coils are subsequently cold rolled, from one to several passes at cold rolling mills. Coils may be heated in a furnace to soften it for further cold rolling or produce the desired mechanical properties. Cold rolling is the last step for some sheet, but other types (referred to as heat-treatable) are subjected to further elevated-temperature processing to increase their strength. Some aluminum sheet and foil products may also be produced using the continuous casting process in which molten metal enters the caster, which produces a hot rolled coil, thus bypassing the ingot casting and hot rolling steps. Aluminum foil is one of the materials used in the creation of labels, and is considered a prime choice when you need to create labels that can withstand varying temperatures, and adverse weather conditions. Aluminum foil can be used in very cold environments and very hot areas too. This material is also non-combustible and flame-resistant, and does not produce any toxic fumes even when exposed to high heat. This is why labels made using this are often chosen by companies for applications that place such tags in such situations. Aluminum foil as a material for your labels is a good choice when you require a label that has a metallic look, lightweight, and cost-effective. It is also a great choice when you know your labels will be used in varying conditions, and when you require a versatile and durable label for such conditions. This particular material type is great for the creation of asset and inventory tags, calibration labels, serial number tags, and many more. Since aluminum foil is non-magnetic and does not spark, it is also a great choice for a lot of high-voltage applications and for use with electronic devices. It is also a good option for when you need a metallic looking tag but do not want the weight and the thickness that often comes with metal nameplates. Tagged aluminum foil plate, aluminum foil plate for labels, aluminum sheet and foil. Bookmark the permalink.